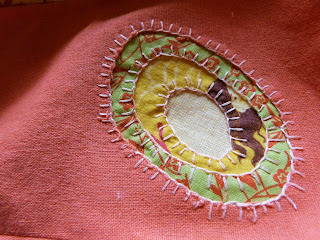 Homespun Stitchworks..... For the love of vintage: How To Sew Reverse Applique... its like stained glass! How To Sew Reverse Applique... its like stained glass! Having had lots of requests about Reverse Appliqué I found this little tutorial for you all to watch! It is really good and shows you how to very simply. It is a little over six minutes long so why not get a warm drink and enjoy! beautiful that would be for a Christmas project, almost like stained glass really. Maybe a gingerbread house for a child to hang at their bedroom window with the winter sunlight coming it it would look gorgeous. I know I know its a long way off Christmas but its worth a think about making for a child's gift most little girls I know would love it .... I might make one for here! Enjoy this midweek tutorial and I let me know what you think. I am getting on with finishing my Christmas/Winter sampler today and then I will be able to show you, yes I have chosen some words eventually!! tomorrow is design day and so I will see you back here on Thursday and another book review as well will be coming up for those of you like me who adore reading books and love stitchery!